Base of Operations: Formerly Serpent Society's underground New York City catacombs. Powers/Abilities: Sidewinder is a teleporter with a range of approximately 10 miles; his range is growing over time as he adjusts to the rigors of that mode of travel. Presumably his teleportative powers are identical to those of the original Sidewinder: an implanted chip in his brain allows him to control tiny Nth Projectors built into his cloak. History: (Official Handboook of the Marvel Universe: Teams 2005) - The original Sidewinder had been created by the Brand Corporation for Roxxon president Hugh Jones, and created and led the Serpent Society. After he left, King Cobra eventually used the Brand equipment (long since stolen by the Society) to create more Sidewinders. One such Sidewinder was killed while in the employ of Death-Sting. (All-New Official Handbook of the Marvel Universe Update#2) - After Sidewinder had been empowered he freed all imprisoned Serpent Society members from their cells. (Captain America IV#31) - After the Serpent Society had captured and chained Captain America and Diamondback (really an L.M.D.) in its underground New York headquarters the pair escaped; Sidewinder was one of many to respond; he was knocked out by "Diamondback." S.H.I.E.L.D. subsequently took Sidewinder and the rest of the Society into custody. (Nova IV#19) - Sidewinder joined members of the Serpent Society in taking hostages at a compound in Danzig, Ohio, caught up in the frenzy of the recent Skrull invasion. 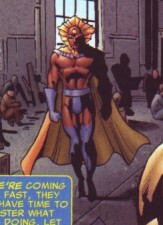 Members of the Nova Corps arrived to quickly defeat them and Sidewinder was blasted by the Centurion Irani Rael. (Captain America: Sam Wilson#5 - BTS) - Sidewinder was presumably still present when Viper (Dixon) monologued to Captain America (Wilson) about how Wilson was destroying America and Serpent Solutions' businesses. Viper ended the monologue by shoving Cap, who had been paralyzed by Asp and was bound to a chair, out a window. He was saved from certain death by the new Falcon (Torres), who was then confronted by Serpent Solutions (excluding Sidewinder). (Captain America: Steve Rogers#13) - Baron Zemo met with Serpent Solutions to ask them to join his Army of Evil. Sidewinder was one of the members joining him. 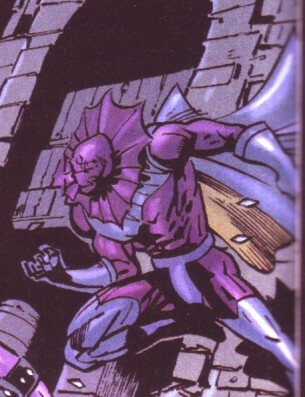 Powers and costume created to mimic the earlier Sidewinders: Seth Voelker and Sidewinder, an Iron Fist foe. The second Sidewinder was intentionally, according to Tom Brevoort, created to not be the original Sidewinder (his speech patterns make this quite obvious). Whether the creator of this third Sidewinder realized that the original was both in jail and semi-reformed and that the successor was dead is not known; in any case, we now have a third Sidewinder. He received a real name in the Serpent Society entry in OHOTMU A-Z HC#10.